Many artists have tried to make a living from glass blowing. 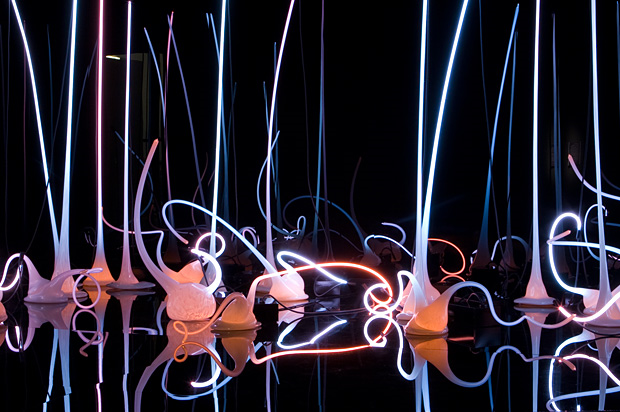 Few have succeeded or even prospered, until Dale Chihuly of Seattle. Dale Chihuly looks much like Tom Douglas to me, was born in 1941 in Tacoma. He has become the quintessential American glass blower and entrepreneur. He studied glass in Venice on a Fulbright Scholarship (sound familiar, Dirty Pat? ), among other academic endeavors. But the ironic part about his profession in glass blowing is an auto accident in 1976 that sent him flying through a glass windshield in England. It blinded his left eye. As he continued to blow glass, he dislocated his right shoulder while body surfing in 1979. He now hires others to hold the glass blowing pipe, enabling him to see his work from more perspectives. Despite this, he has become enormously popular and successful, with an estimated $29 million in sales based on a Seattle Times report in 2004. He and his team of artists have been part of a PBS documentary, starting on November 1, 2008. •1992: Chandeliers, starting modestly but by the middle of the decade involving a ton of glass orbs and shapes that in some works look like flowers, others like breasts, and still others like snakes Chihuly has also produced a sizable volume of “Irish cylinders”, which are more modest in conception than his blown glass works. I have seen his exhibits in San Francisco, as well as Seattle. But his largest exhibit is actually located in Oklahoma City Museum of Art. I did not know they new art in Oklahoma. He also has a retail store in the Bellagio in Las Vegas, and another at the MGM Grand Casino in Macau. Now, he has taken over the former Fun Forest at Seattle Center to become the Chihuly Garden and Glass. Just take the Seattle Monorail out there and you cannot miss it. It sits in close proximity to Paul Allen’s Experience Music Project (EMP). The Garden contains eight galleries and three drawing wells. 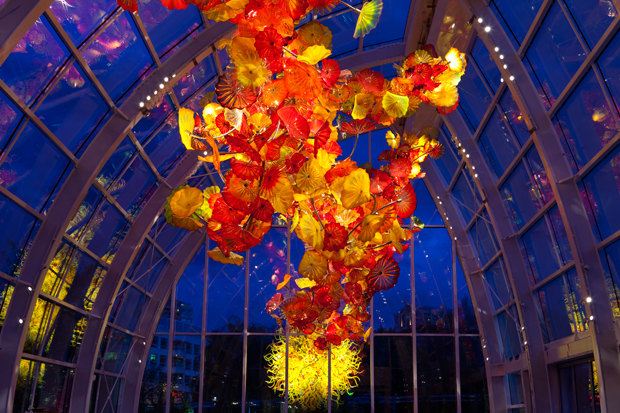 Perhaps the glass forest below provides insight into how Chihuly has pushed the art form to its current status. The glasshouse is forty feet tall, covering 4500 square feet of light-filled space. The fire orange baskets below are among the largest sculptures he has created. It shows his continual push of the boundaries of scale with his glass work. He wants people to feel they are coming upon his work as if arriving in nature. I would say it is nature on steroids. There is nothing subtle about his works. This quote from Mr. Chihuly sums it all: “If I had not been a sculptor or an artist, I would love to have been a film director or an architect.” Sounds good to me. More from sunny Seattle later. They actually do not care since their Seahawks are unbeaten!